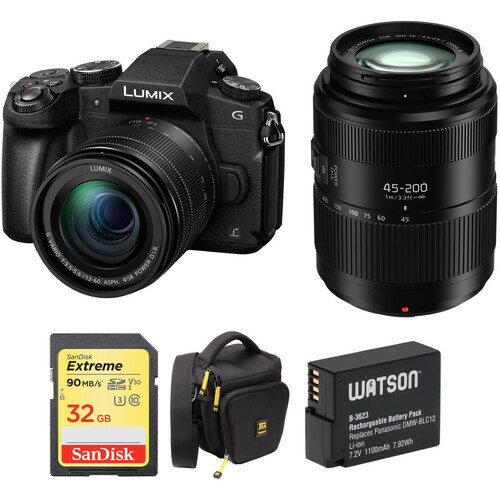 Tackle stills and video, and make sure you have access to nearly every focal length from wide angle to super telephoto with this B&H Kit, which features the Panasonic Lumix DMC-G85 Mirrorless Micro Four Thirds Camera along with the Lumix G Vario 12-60mm f/3.5-5.6 Lens, Lumix G Vario 45-200mm f/4-5.6 II Lens, and a shoulder bag to carry it all. The impressive 4K-shooting 16MP camera is fast and feature-rich, and when combined with this pair of zoom lenses is exceptionally versatile without weighing you down. Designed for video and stills shooters alike, the Lumix DMC-G85 from Panasonic is a versatile Micro Four Thirds camera characterized by its quick performance, flexible photo capabilities, and UHD 4K video recording. Using a 16MP MOS sensor, this mirrorless camera has a sensitivity range from ISO 200-25600 to suit working in a variety of lighting conditions, and also affords quick shooting speeds up to 10 fps with single-shot autofocus, or 6 fps with continuous autofocus, as well as up to 40 fps when using an electronic shutter function and 30 fps at 8MP with 4K PHOTO Modes. Benefitting working in difficult lighting conditions, 5-axis sensor-shift image stabilization can be used to dramatically reduce the appearance of camera shake, and this IS system pairs with select lens' image stabilization systems for Dual I.S. Complementing the imaging attributes, the camera also incorporates both a 2.36m-dot electronic viewfinder as well as a 3.0" 1.04m-dot touchscreen LCD, which has a free-angle design to better enable working from high and low angles. Built-in Wi-Fi is also integrated into the design, which facilitates wireless image transferring and remote camera control from linked smartphones or tablets. Additionally, the body construction is weather-sealed to guard against dust and moisture for working in inclement weather conditions. Included with the camera body is the Lumix G Vario 12-60mm f/3.5-5.6 ASPH. POWER O.I.S., which is a standard zoom lens that provides a 24-120mm equivalent focal length range. Its optical design incorporates three aspherical elements and one extra-low dispersion element to reduce both chromatic and spherical aberrations throughout the zoom range. POWER O.I.S. is also featured to minimize the appearance of camera shake, and works in conjunction with the camera's sensor-shift IS for more effective shake correction. Included with the camera body is this versatile 24-120mm equivalent wide-to-tele zoom, which is well-suited to a variety of shooting applications. This POWER O.I.S. system pairs with the camera's sensor-shift IS system, using Dual I.S., for effective control of camera shake for sharper handheld shooting. The lens also utilizes a trio of aspherical elements and one extra-low dispersion element to minimize spherical and chromatic aberrations for increased clarity and sharpness. A variety of bracketing modes can be used for shutter speed, aperture, and white balance settings. Focus bracketing is also possible, for up to 999 images with focus steps set in 5 levels, for focus stacking applications. Creative Control modes allow you to apply a unique look to imagery in-camera, and include Expressive, Retro, Old Days, High Key, Low Key, Sepia, Monochrome, Dynamic Monochrome, Rough Monochrome, Silky Monochrome, Impressive Art, High Dynamic, Cross Process, Toy Effect, Toy Pop, Bleach Bypass, Miniature Effect, Soft Focus, Fantasy, Star Filter, One Point Color, and Sunshine. Photo Styles can be used to impart a distinct quality into either stills or videos, and include Standard, Vivid, Natural, Monochrome, L. Monochrome, Scenery, Portrait, Custom, Cinelike D, Cinelike V.
A Silent Mode can be used to mute camera noises for more discreet shooting in sound-sensitive environments. Covering an impressive range of telephoto focal lengths, the Lumix G Vario 45-200mm f/4-5.6 II POWER O.I.S. Lens from Panasonic is designed for Micro Four Thirds cameras, where it provides a 90-400mm equivalent focal length range. Benefitting the lens' reach is a sophisticated optical design that includes three extra-low dispersion elements to reduce color fringing and chromatic aberrations for notable clarity and sharpness. Complementing the optical performance is an apt POWER Optical Image Stabilizer system, which minimizes the appearance of camera shake and is also compatible with Dual I.S. for enhanced stabilization while shooting stills or video. A linear autofocus motor is also featured, for quick and quiet focusing performance, and the lens sports a splash and dustproof physical design to suit working in harsh climates. Telephoto zoom for Micro Four Thirds mirrorless cameras, this lens provides a 90-400mm equivalent focal length range. Three extra-low dispersion elements help to reduce chromatic aberrations and color fringing for improved clarity and color accuracy. The Hunter 25 DSLR Holster Bag from Ruggard is slightly larger than the Hunter 15 and holds your DSLR with lens attached, face down, in shooting position. When you're ready to shoot, simply remove your camera, get the shot and replace your camera in the bag. The zippered top of the bag opens away from your body for fast access to your gear. This also serves as a security feature since no one but you will be able to see inside the bag. The bag has a water-repellent exterior and smooth polyester lining that helps prevent scratches to the finish of your camera/lens combo. Inside, there are two removable touch fastened strips that can be configured to support your gear. For storage, there is a front zippered organizer panel, mesh side pocket and two side loops that accept optional pouches. On the inside of the quick-release flap, there are two touch fastened memory card pockets. The bag is carried by its removable shoulder strap, top carry handle or belt loop that will leave you hands free. The zippers have yellow pull tabs that make the bag easy to use while you're wearing gloves. The Watson DMW-BLC12 Lithium-Ion Battery Pack works with the same cameras as the Panasonic DMW-BLC12, Leica BP-DC12, and Sigma BP-51 batteries. This replacement battery pack features a capacity of 1100mAh, 7.2V of output power, and 7.92 watt-hours. Small and lightweight, lithium-ion batteries can be charged or discharged at any time without developing memory effect. Box Dimensions (LxWxH) 7.6 x 6.9 x 5.1"
Box Dimensions (LxWxH) 7.2 x 4.6 x 4.5"
Box Dimensions (LxWxH) 8.5 x 7.0 x 5.0"
Box Dimensions (LxWxH) 5.6 x 3.1 x 0.4"
Lumix DMC-G85 Mirrorless Micro Four Thirds Digital Camera with 12-60mm & 45-200mm Lenses and Case Kit is rated 4.7 out of 5 by 78. Rated 5 out of 5 by Warren from Awesome addition to my gear!!! So far this has done an awesome job on pics!!! I got this camera as my first mirrorless and I am not disappointed. I have not tried to record with it yet so I am not sure of the jitter issues I heard can happen with focus tracking. Panasonic did release a firmware update on 11/16 to correct. The menus are easy to work with and customization is fantastic. There are 2 custom settings on the main drive dial and the second one will allow for 3 setting. That's 4 total settings to switch too. I am looking forward to working with this camera and combining it with my Nikon d7200 lense with the 4/3 to F mount adaptor. This camera is making for a nice combo with the D7200. Rated 5 out of 5 by Anonymous from Awesome APO shipment and Product B&H, I have to say that you earned my trust for overseas delivery. I am deployed currently in the Middle East and the camera + rode mic came well packed and right under two weeks. B&H took very good care to package the equipment and thanks for that. Due to some dumb lithium battery regulation for shipping overseas, B&H was nice enough to install the battery into the camera so that it met the safety regulation for the post office. Just note, it is easier to call B&H to have this done since there seems to be an error when trying to check out over the web. Wish there was an option for that without having to call. Other than that, great service and product! Rated 4 out of 5 by John from Many Improvements The G85 compared to the G1 & G5 is a larger more robust camera with better build quality and over 40 new or upgraded features. Many of these new features are complex and will require an extended learning curve with many visits to the advanced manual. The video button remains recessed and is difficult to locate by touch. On off for it would be an excellent feature to be able to add to the Quick menu. My grip still presses the Display button when it is not desired. Yours may not. Overall a step up with welcome improvements vs The G1 & G5. Well done Panasonic. Down load & read the advanced manual If you are considering it as your next camera. Rated 4 out of 5 by William from Very Good - not perfect I am a wedding and event videographer, with a GH4 already in the arsenal as well as several other video cameras. We purchased the G85 to upgrade the equipment of our 2nd shooter, so we rely on it for such things as groom's preps and second camera for photo sessions and ceremony. It excels at just about everything we try use it for in good light, however, during receptions, when the lighting comes down, even with onboard lighting, the autofocus becomes absolutely useless. In darker situations, we find it works best focusing manually, and zoomed out to the max. Overall - considering the reasonable price, for us it was a definite upgrade. Rated 5 out of 5 by Anonymous from Gran camara todo terreno Una cmara todo terreno, esta es la mejor definicion para la G85. Las imagenes son vividas y nitidas, con un color agradable, La estabilizacion es excelente, incluso con lentes Olympus. No he tenido ningun tipo de problema con la estabilizacion en video. El 12-60 que viene con la camara, es un zoom muy bueno para su precio, A prueba de agua y polvo, con pantalla totalmente articulada, excelente calidad de imagen en Jpg. Filmacion 4k, e infinidad de modos de personalizacion. Recomiendo para quien busque una camara de excelentes prestaciones a un precio razonable. Rated 5 out of 5 by Mark from Fantastic camera Don't be put off that it's "only" 16MP.? The lack of AA filter plus improved processing means the photos look as good or better than 20MP cameras.? It's lightweight and feels great in the hand. I tried the G9 and it just felt too big and uncomfortable, so I decided to stay with the G85.? The image stabilization is incredible, especially with those Panasonic lenses compatible with Dual IS II.? I was very pleasantly surprised with the high ISO performance as well, getting clean photos up to ISO 6400.? Even though it is contrast detect AF, Panasonic's DFD AF system works amazingly well, even in low light.? Honestly, it's the fastest and surest autofocus I've ever used (and I've been a photographer for 40+ years).? Highly recommended. Rated 5 out of 5 by Jason Rae from Best Value for 4k video on the market! I got this camera to replace my second gh4 because we shoot a lot of handheld videos. This is hands down the. Eat value as of today for 4k video shooters. The 4k is sharp and clean and very detailed. It's better in low light than my gh4 and we have got so many great shots because of the IBIS. The IBIS hands down spanks our Sony a6500 and they are not even in same ball park in this category. This is a great camera that takes nice stills and amazing video! 1) unlimited 4k video recording or 30min2) crop in 4k video? Does this have hdmi output live view while recording to sd card? This will do live HDMI output while recording to an SD card. Is this the best lumix for in camera Focus stacking? Of the Panasonic Lumix cameras, we would prefer to use the DMC-G85 yes. More features, more control, better form factor and build quality. hdmi output while recording 4K video in SD card? Yes, the g85 has full 4k output via HDMI while recording to the memory card. Is this camera made in Japan? Camera is made and assembled in China. Is there a headphone jack or some other way of monitoring audio recording and playback through headphones? There are a few microphones that have headphone jack for monitoring. See Shure VP83S for $300. am only able to use the widest (10mm) setting on canon 10-18mm kens attached to G85 with Vello adaptor, no focus capability. anyone have any experience using wide angle (any brand). i use aperture pref. and man focus. are any zoom lenses usable with these adaptors w MFT cams? Vello makes two adapters. If you are using the Vello Canon EF/EF-S Lens to Micro Four Thirds Camera Auto Lens Adapter B&amp;H # VELAEMFTCEFA, it would offer autofocus but only selected lenses. In terms of only being able to use the lens at it's widest focal length, you may want to contact Vello directly for further assistance by calling 212-594-2120. How many times release does the G85 shutter unit is durable? (The GH5 &amp; G9 showed : The shutter unit is durable for approx. 200,000 times release . Thanks. Normally manufacturers do not list such numbers for there are warranty issues. I would imagine for this consumer camera, 100,000 to 125,000 would be a reasonable number.